Affordable websites for small businesses. I’ve been doing a lot of work on the Breckenridge Airshow pages for the Breckenridge Chamber of Commerce lately. We’re utilizing contact forms to streamline applications for all sorts of things related to the airshow – volunteers, guest pilots, sponsorships, etc. These pages are a great place to see some of the ways contact forms can be used and also the types of form options that are available. Text boxes… These are “single line” text boxes. The red * indicates a required field. Any field in a form can be made either required (must be completed to submit the form) or optional. 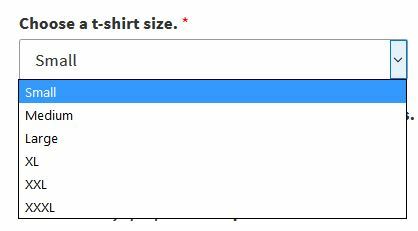 Drop-down menus… Options can be customized as with t-shirt sizes, yes / no, etc. Text area… The field on top is a single-line text box and the field on the bottom is a text area. Both will accommodate both text and numerical responses, but obviously a text area is more appropriate for longer responses. I use a contact form for my New Client Questionnaire, and Photo Book Designs uses this same functionality for their order form and also to facilitate customer testimonials. Of course, contact forms can also be used for simpler things – like helping your customers simply… contact you! Barking Dog Website Design specializes in designing websites for small businesses that currently have little or no internet presence.